Let’s see if we can fill up the Blue Mosque first, before Hagia Sophia,” stated the Turkish Prime Minister Recep Tayyip Erdogan, giving a diplomatic answer to those who want to see the conversion of Hagia Sophia into a mosque. Erdogan attended a ceremony for the reopening of İstanbul’s Ortaköy Mosque, which has been under renovation for the last three years. “There is the Sultanahmet (Blue) Mosque next to Hagia Sophia but remains empty during regular daily prayers. We should fill this mosque not only during congregational prayers but also at other times. You should accomplish this first,” said the Turkish premier in his speech. In May 2013, he had given the same response at the meeting of his party when members of the Justice and Development Party had raised the issue for the first time. 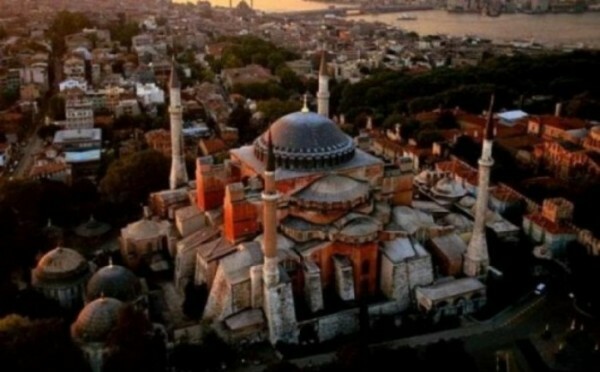 The pressures for the conversion of Hagia Sophia into a mosque come mainly from the Welfare Party, that last week organized a Muslim prayer in front of the Greek Orthodox church. The event was attended by thousands of Muslims who were asking for Hagia Sophia’s conversion into a mosque.